My grandmother was always in charge of the pumpkin pie at Thanksgiving which she called a Pumpkin Custard Pie. I never got the recipe and she never wrote it down as she knew it by heart. So this Thanksgiving I went on a quest for a Pumpkin Custard Pie recipe that would come close to Mamaw’s. And, I found one, only with an interesting addition–Bourbon, Rum, or Brandy! Hmmmm! 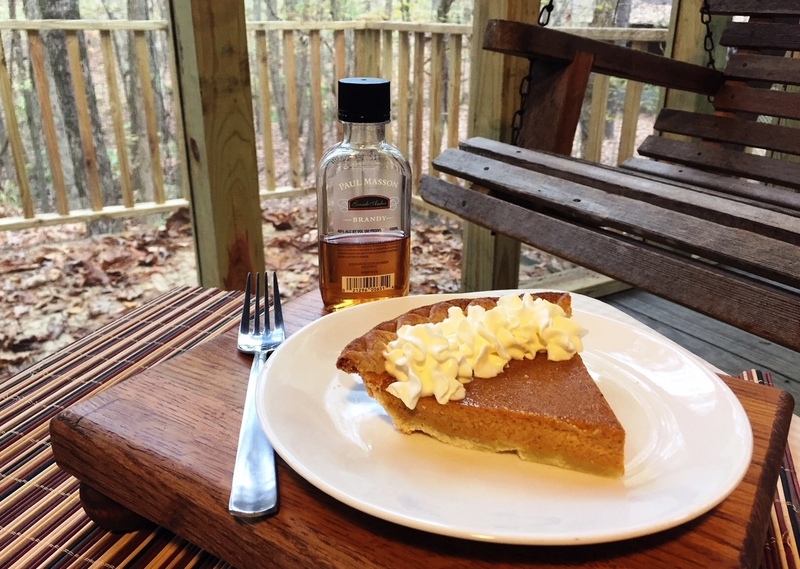 Being the good Southern Baptist that she was, Mamaw would have made us eat this pumpkin pie on the “back porch” just in case the preacher dropped by for dessert. For those opposed to a little “nog” in their pumpkin pie, I’ve included a “Front Porch” version as well. Happy Thanksgiving!! Preheat oven to 350 degrees and bake pie crust for 10 minutes. Tip: Pricking the bottom of pie shell will keep crust from puffing up. When done and slightly brown, remove from oven. Turn oven up to 425 degrees. While pie crust is baking, prepare filling. Combine dry ingredients. Stir in beaten eggs and pumpkin. Add heavy cream (or half & half) and liquor (or vanilla) stirring well. Pour filling into baked pie crust and bake at 425 degrees for 15 minutes. Turn oven down to 350 degrees and bake for 35-45 minutes. Pie is done when an inserted knife comes out clean. Remove from oven and allow to cool for 2 hours. Serve immediately or refrigerate.